It was near the end of the evening. Near the end of the film’s second screening. 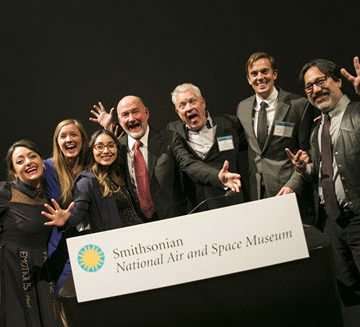 As the long, glorious night that was the world premiere of Dream Big: Engineering Our World at the Smithsonian National Air and Space Museum in Washington, DC, wound down, at the base of the theater – hidden in darkness just out of the audience’s sight – Avery Bang and Menzer Pehlivan couldn’t help themselves. Exhausted but exhilarated, they just had to dance. With the closing sequence of the film’s music blaring through the IMAX theater, ASCE’s newest movie stars enjoyed the moment as only they could – with spontaneous, uninhibited happiness. “We are both fun and we are so alike,” Pehlivan said. “She’s a little cooler than I am, but I’m cool with that.” And they laughed as they exited the theater together. It’s a joyous spirit that reflects both the two engineers’ personalities and the passion behind the film. Dream Big, presented by Bechtel and produced by MacGillivray Freeman Films in partnership with ASCE, tells the macro-story of engineering through the inspiring micro-stories of the work done by Bang, Pehlivan, and other engineers around the world. Bang, EI, A.M.ASCE, is CEO of Bridges to Prosperity, and a section of the film follows her team’s efforts to assist a community in Haiti in building a crucial foot bridge. Pehlivan, Ph.D., P.E., M.ASCE, is a geotechnical engineer at CH2M in Seattle, and the film features her earthquake reconnaissance work in Nepal. And as a bonus, it’s narrated by Jeff Bridges. 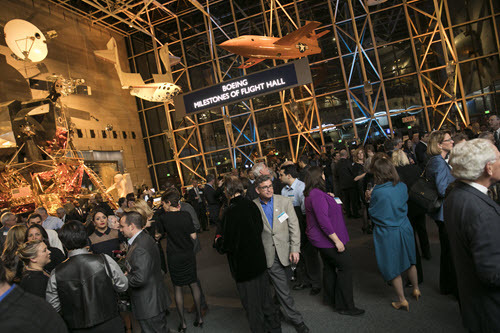 The premiere brought together ASCE and Bechtel leaders from near and far for a glamorous, red-carpet experience. Some like National Capital Section member Jameelah Muhammad, P.E., M.ASCE, made the short trip from her D.C. home. Others like Elizabeth Ruedas, EIT, QISP, CSI, ENV SP, LEED GA, A.M.ASCE, the Orange County Branch secretary, flew in all the way from Los Angeles with her mother for the occasion. It was a personally gratifying night for the Bechtel family. 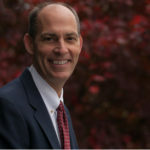 Brendan Bechtel, CEO of Bechtel Group Inc., the fifth-generation family member to lead the company his great-great-grandfather started in 1898, introduced the film, with his parents in the audience. His grandfather, Stephen D. Bechtel Jr., was champion and benefactor for Dream Big from the project’s outset. Many ASCE members have seen rough cuts of the film at various Society events during the last six months, but this was the first chance to see the final version in the full 3D IMAX treatment. ASCE President-Elect Kristina Swallow, P.E., ENV SP, F.ASCE, couldn’t pick just one aspect of the film as her favorite. “I love the whole film,” she said. Angelica Hernandez, another of the engineering role models featured in the film, attended the premiere along with the teacher who helped inspire her, Fredi Lajvardi of Phoenix’s Carl Hayden Community High School. Together, they hope to inspire even more students through the film. Dream Big debuts on giant screens across North America for the general public Feb. 17, and ASCE and its partners have developed a plethora of educational materials aligned with the film. Find more than 50 Dream Big hands-on activities, 10 webisodes, 12 lesson plans, and three design challenge exhibits. And if the goal was to bring civil engineering to life and get kids excited about the profession, it’s clear that ASCE and Dream Big couldn’t have found more enthusiastic advocates than Bang and Pehlivan. The two basked in the excitement of the moment Wednesday night, talking with audience members, maybe even signing some autographs – true believers in the power of civil engineers to change the world. And newfound kindred IMAX spirits. “We both have certain loves for certain things,” Bang said. “We both obviously are super-engineery, enginerdy in certain ways. She’s very girly; I’m very not. But it takes all types,” she laughed. With the film ready for release to audiences worldwide, their Dream Big journey is only just beginning. Learn more about where you can see the film and how you can get involved in Dream Big outreach activities. ASCE has led the Dream Big initiative with Bechtel, the ASCE Foundation, NCEES, UEF, and a coalition of engineering organizations. 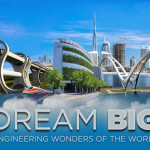 I viewed the Dream Big film in Dublin, Ireland as a member of the Council of Engineers Ireland. I enjoyed the film which I think will play an important role in informing societies about the central function of science and engineering in society. Well done to all involved in the Dream Big project. As a civil engineer, who presents lectures on Science and Engineering all over Ireland, I believe that Europe and North America should be collaborating in this area to the greatest extent possible to ensure technical innovation, economic development and environmental protection. It might be of interest to American civil and highway engineers.